This is less of a book review than it is talking about a book re-view. When I was in fourth grade, I pretty much lived down in my school library. I finished my assignments so far ahead of my classmates that my teacher sent me off to the library so I wouldn’t get bored and cause trouble. (Not that I was a troublesome kid, but if I was bored, I would try to entertain myself- sometimes caused unintentional problems.) 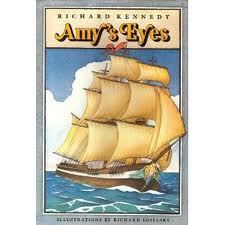 I read through great swathes of that room in my years at that school, and one of the books on the shelf was this great fat thing with selveged pages called Amy’s Eyes, by Richard Kennedy. I fell in love with that book. It was an epic thing of sailors and pirates, the search for treasure, family lost and found, secrets, dolls coming to life and even little girls becoming dolls out of loneliness and sorrow. It had orphanage hi-jinks and adventure on the high seas, it had mutiny and religion and nursery rhymes, and what made me truly fall in love with the book- and this may or may not say something significant about me- was that it taught me the song Greensleeves. I checked that book out several times that year and next, and when I found that my middle school library didn’t have it, I checked it out from the public library. I read that book at least twelve times through the next three years. But then Things Happened, and real life intruded, and with how insane my schedule was, the public library became rather hard to get to, and while I still thought fondly of the book, there wasn’t really a chance to catch up with it. Fast forward to senior year of college, as I’m sitting down with my honors thesis advisor and talking about the influence of books in my life, and he tells me to track down a handful of books with significant influence and re-read them. Some were things I still read again and again- David Eddings’ Elenium trilogy, for example, which is largely responsible for my sense of humor- but I immediately thought of Amy’s Eyes. I remembered it as being a great adventure full of sweetness and laughter. It was out of print and a little tough to track down- none of the libraries I had access to had it, not even the trusty library back home; it had been stolen and they hadn’t replaced it. I finally found a used copy online that a former library copy, and not too dinged up (I’m a little OCD about my books), and when it came, I settled down to immerse myself in childhood nostalgia. Somehow in reread after reread after reread when I was younger, I had managed to completely miss how CREEPY large portions of that book was! There were some sections, even some characters, who absolutely made my skin crawl coming back to it almost ten years later. This went far beyond merely unsettling- this was sit up awake in bed clutching the baseball bat against the moving shadows terrifying. As a child, I’d categorized the characters into three groups: Good, Bad, and Surprise. As an adult, the characters were much more difficult to dismiss into those simple corners. I understood a lot more of the nuances in their personalities, got a lot more out of the shifting loyalties and the plaintive confusion at their existence. The nature of identity, the simple fact of existence, weaves through this story in ways I never could have grasped when I was nine years old. As a child, I thought parts of the book were sad. As an adult, I found some parts downright tragic- and not always the same parts. I learned about disguise as a part of truth and how far some people would go for love- and for greed. There were a few stray elements that I remembered as being the same, but in so many ways, it was like I was reading a completely different book. For the next two weeks, before my next advisor meeting, I tried to wrap my brain around just how different this was from what I’d remembered, and therefore expected. The book, of course, hadn’t changed. I was two years old when it came out, and the text hasn’t altered a bit since the date of publication. What had changed was me. Another decade of life, another decade’s worth of experiences, had changed my perspective on things. As a child, I didn’t understand anything about betrayal or greed or black-hearted villains except for what I read in books. As an adult, I’d learned, and if I’d sometimes mourned the knowledge, I still had the deeper experience. Limitless devotion wasn’t something I took for granted anymore, so seeing just how far some of these characters would go to protect and reunite with the ones they loved wasn’t something I took for granted anymore either. Because of those life experiences, everyone reads the same book in different ways. What I learned from re-reading Amy’s Eyes proved invaluable when I wrote the novel for my thesis, and for each novel after that. The character who was most deeply unsettling was also the one for whom we feel the deepest sympathies. Good and evil were not nearly as separate as I’d previously imagined, and just because a person is Good, it doesn’t mean they don’t have deep flaws within them. And perhaps the deepest lesson- the one that wove its way through again and again in what became Elsinore Drowning: sometimes we injure those we love the best, even when- or perhaps especially when- we’re trying to do what’s best or right. Have you ever had a book that seemed drastically different upon a re-read? Hmmm. Never heard of Amy’s Eyes before, but I may have to read it! I just came upon your review thanks to a Google search for a lost memory of a book I had read and treasured as a child… and I’m so very glad I did. i, too, read Amy’s Eyes multiple times at different ages throughout my youth, but unlike you, haven’t given myself the opportunity to reread it as an adult — and now I can’t wait to. I know I have exactly that same thick copy you spoke of tucked away in one of many crates of books, and it will take some digging to locate, but I’m determined, now, to find it. When I first read the book, I was also about nine years old, and had also read my way through most of my tiny school’s tinier library, and had moved on to choosing the books that looked the most daunting — half out of a strange childhood version of ego, wanting to prove that of course I could read whatever I pleased, I was that smart, didn’t you know? — and the other half out of a genuine interest and innocent self-satisfaction I felt from not proving to anyone else, but to myself, that yes, I could, and not just that, but I Wanted to. The wanting felt the most important, if you can understand what I mean… I didn’t care much for the thought of being smart, but I liked the way that reading made me different from other classmates. Perhaps some of them could sit down and read what they liked, but it seemed so very rare that any of them ever did. Of course, I can’t know that for sure, but it wasn’t spoken of. Kids ran around and played outside, got into mischief and did what kids do, but I wasn’t just riding bikes or playing tag in the yard, I was doing all of that AND I was READING. for FUN no less. It felt like a secret society, a world where I got to know the secrets and stories that all the books held, and because of that, I felt special, in my own, private, silly little way. I might sound crazy, but I feel like you may relate! I remember this book back in elementary. There was always a waiting period to check it out because EVERYONE wanted to read it. I was lucky enough to read it twice. It’s one of those books you remember forever. I’m 30 years old and am looking for a copy.